Rotavators are powerful pieces of gardening machinery, often used in gardens, allotments and fields, to breakup, churn and aerate the soil prior to planting seeds and bulbs or laying turf. Rotavators use a set of blades or rotors which spin and break though the soil. This improves drainage, levels the area and makes the ground perfect for growing vegetables and crops. Rotavators are available in different sizes for different applications. 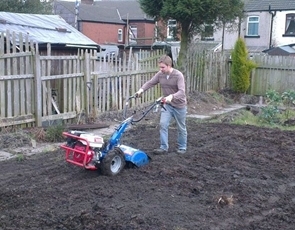 Tillers are smaller models, designed specifically for use in the garden and on small allotments. Larger models, such as our medium duty cultivator and our heavy duty hydraulic rotavator, are designed for use on larger plots of land, vegetable patches and fields. These are powerful pieces of professional equipment and they are better equipped for larger jobs. Before deciding when to use a rotavator, it is important to take the moisture in the soil into consideration, especially if the soil is compacted, or if it has never been tilled before. Although a rotavator can be used on sandy soil at any time, soils high in clay behave differently when they are wet to when they are dry. When clay soil becomes dry it gets very hard. If the clay soil in your garden or allotment is too hard, using a tiller or rotavator to cultivate the land can be very difficult and the tiller / rotavator may not be able to do more than scrape away at the first couple of inches of soil. If the soil is too wet, it forms clods when tilled. Those clods become like rocks when they dry, and this can ruin the soil until the next winter's weather softens them again. If your soil is compacted or has never been tilled before, water it for several hours, three or four days before tilling. Then check to see whether the soil has drained enough to be tilled. You can do this by picking up a handful of soil from the bottom of a 6-inch deep hole and squeezing it into a ball. The ball of soil should be easy to break apart with one finger. If it dents rather than breaks, the soil is still too moist to till. Before rotavating new ground, you should remove any weeds a few days in advance. If you rotavate through weeds, they can get caught in the rotavator's tines and spread around the plot of land. Ground tillers and rotavators can be dangerous if they are not used properly and if the correct safety precautions are not taken. It is essential that you keep your feet and hands away from the tines, and you must stay in control of the machine at all times. Safe operation requires having the correct rotavator for the job and not moving along too quickly with the rotavator. It is also advisable to use ear defenders and padded gloves, especially if you're using a heavy duty rotavator over a large area. Tillers and rotavators can buck and gyrate whilst working. Using physical strength to control the rotavator will make you tired quickly, and could cause muscle injury. Instead, you should stay relaxed and let the rotavator jump when it hits something hard, and then guide it back on track. This occurs mostly when tilling new ground. Pushing down on the rotavators handlebars allows you to control how big a bite the rotavator takes. You should rotavate the land in strips, slightly overlapping with the previous strip as you move on to the next strip. Make two or three passes over each strip, and repeat the process at right angles to the original rotavated strips. Don't dig much deeper than two or three inches deep on the first pass. You can then set the rotavator to dig deeper on each pass after that.